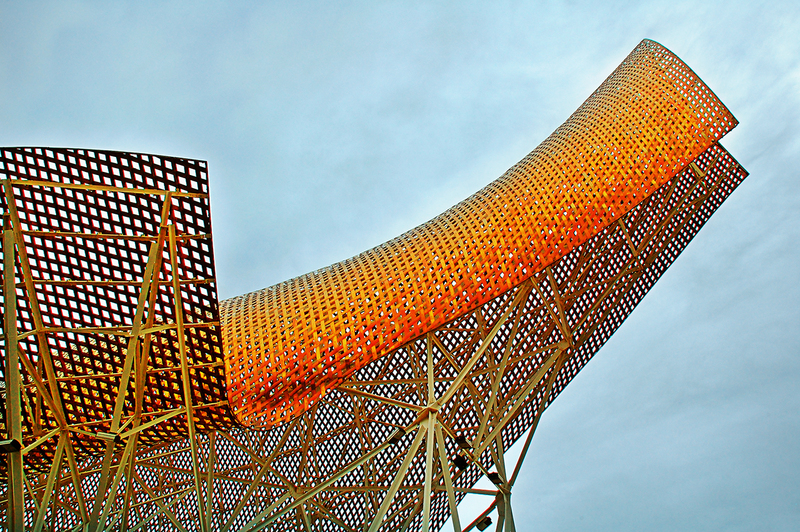 The Gold Fish or Peix D'Or by Frank O.Ghery near Hotel Arts and Paseo Marítimo is located in the middle of a complex of restaurants, shops and discos known as the Olympic Port which is one of the most visited spots in the city specially at night. Check a previous post with the Gold Fish silhouette in the distance. The sculpture built in 1992 for the Olympic games acts as a canopy for some of the restaurants and a fountain in the underground floor. It looks nice. I assume it is metal or painted a rust color. I would afford lots of shade I would guess. You have managed to perfectly capture the wonderful rich colours and metal network of this sculpture. Wheever I visit Barcelona I love to hire a bicycle and ride along the promenande from the Port Vell area, through Barcelonneta, past the Gold Fish and Olympic village and on until I reach the Forum and back again (resting on the concrete chairs). I'm not particularly athletic but it is just a wonderful journey along the sea front. Very exhilerating. My goal is to stay at the Hotel Arts but I think that I will need to win the lottery first!!!! wooow nice shot. I tryed when i was in barcelona also tot ake just a nice photo of the golden fish. But this angle is so good nice. Thanks again. I really appreciate your comments.